It was a cruel change to the spreadsheet – but I had to replace the >24″ bin with >1″ bin. 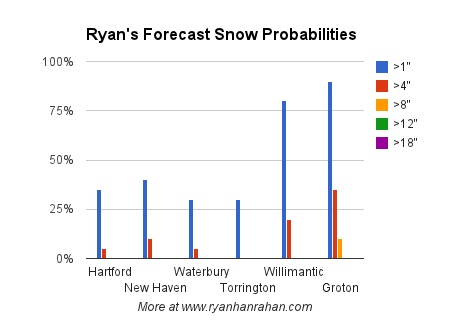 It’s back to southern New England snow reality after a brief hiatus. 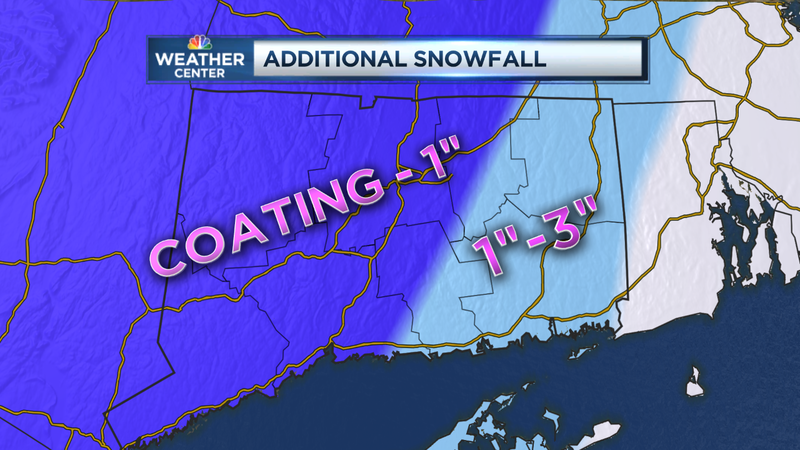 Here’s the more typical snow accumulation map. Here are all the dorky details on the snow! A beautiful and impressive period of bombogenesis is underway off the Carolina coast. The synoptic setup is picturesque. The 250mb GFS forecast shows a powerful coupled jet streak resulting in very strong lift over the Canadian Maritimes and adjacent parts of the North Atlantic by 18z Sunday. Cyclogenesis is already underway with a potent PV disturbance rounding the base of the trough and heading offshore. With the trough remaining progressive and with a neutral tilt this low isn’t going to hug the coast. 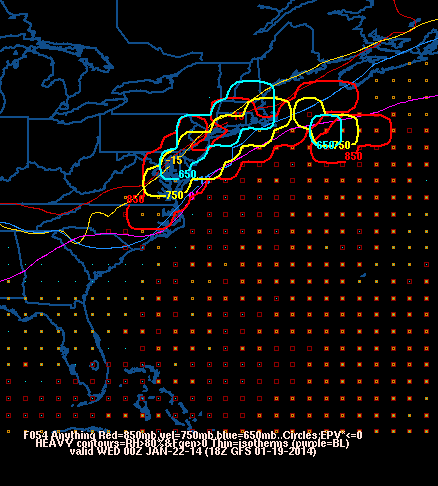 In fact, convection firing offshore over the Gulf Stream argues for a farther offshore track. 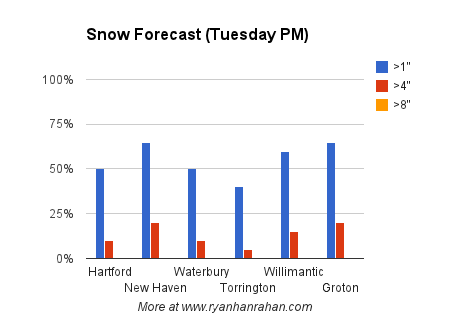 Regardless, as the storm winds up offshore winds are going to ramp up and we will see a period of light to occasionally moderate snow clip Connecticut. The light snow across the region this evening is due to mid level frontogenesis that is occurring overhead. The NAM and GFS shows a band of frontogenesis from just off the New Jersey shore through western Maine of. 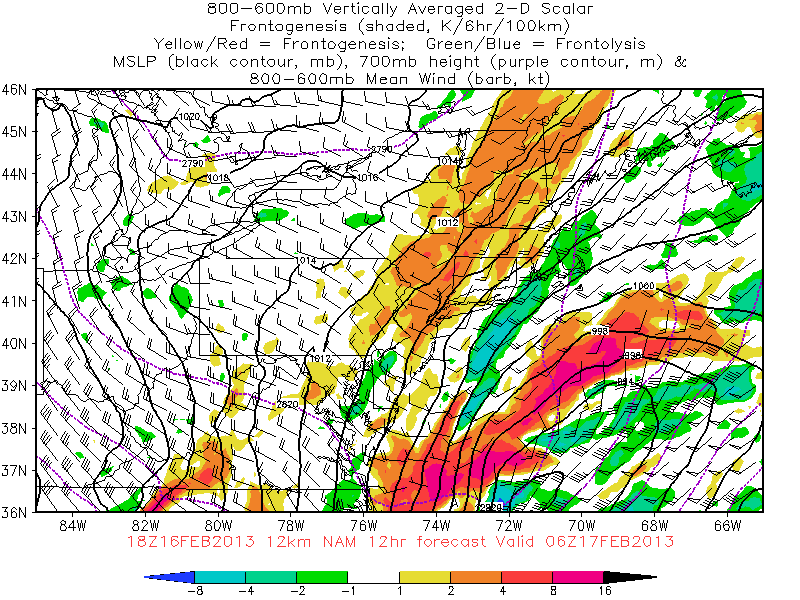 I’ve attached the 800-600mb vertically averaged frontogenesis. The tightening of the thermal gradient (frontogenesis) results in a thermally direct circulation (need to restore thermal wind balance!!!). All of this leads to a band of vertical motion that produces an area of enhanced precipitation within a larger area lighter precipitation associated with the synoptic scale ascent. You can see on radar the band of precipitation that lines up pretty well with the forecast area of frontogenesis. While the band of snow overhead looks relatively impressive on radar it’s anything but impressive on the ground. A gusty northerly wind is advecting dry air through the boundary layer. 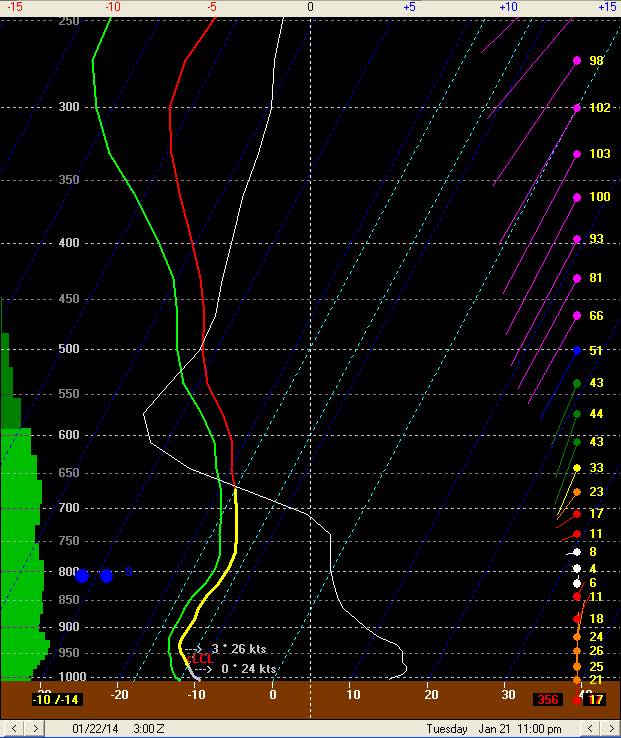 It will be a tug of war all night between snow being produced around 700mb (nice snow growth too!) and a steady stream of dry air coming south in the boundary layer. We’ll sublimate more snow than will fall! Here’s the 00z OKX sounding that really tells the story. Bottom line is that this “event” will wind up pretty marginal. The actual low and mid level low centers that close off will wind up too far east to clip us with the comma head. The frontogenesis producing -SN overhead will slowly weaken and scoot east later tonight. A cold front in eastern New England is producing snow across western New England! Weird, right? This is what we call an anafront. These produce precipitation behind the front (as opposed to ahead of it) thanks to strong frontogenesis. In addition there is some mid level “lift” thanks to a series of shortwaves wrapping around the trough to our west. The radar is impressive and some towns in Connecticut could pick up 1″-2″ of accumulation tonight though most towns will see only a coating. Across Vermont more impressive snow aided by a upslope snow could produce a half foot over the high terrain.